A massive plume of ash rising from Hawaii’s Kilauea volcano prompted a warning yesterday to pilots planning to fly over the area. The eruption isn’t just dangerous to people on the ground anymore — it could also bring down planes. Volcanic ash is an airborne blend of crushed rocks, glass, and gases that can clog a plane’s speedometer, kill the engine, and sandblast the windows, which impacts visibility. In the 1980s, several planes nearly crashed when their engines died after flying through ash clouds. These days, volcano observatories and volcanic ash advisory centers around the world issue color-coded warnings to the aviation industry. The warnings range from green — which means a volcano isn’t erupting — to red, which means that it is erupting or could be soon. These notices aren’t orders: in the US, the Federal Aviation Administration is in charge of telling the pilots what to do. “We’re just saying, here is the threat: here’s the ash, here’s where it’s at, here’s how it’s being distributed,” says volcanologist Kristi Wallace. No one at the Hawaiian Volcano Observatory was available to speak on the phone before this article published. But Wallace, who works with the Alaska Volcano Observatory, says that all of the volcano observatories around the country are chipping in. “The observatories in the United States are all under the same figurative roof, we’re all one agency,” she says. 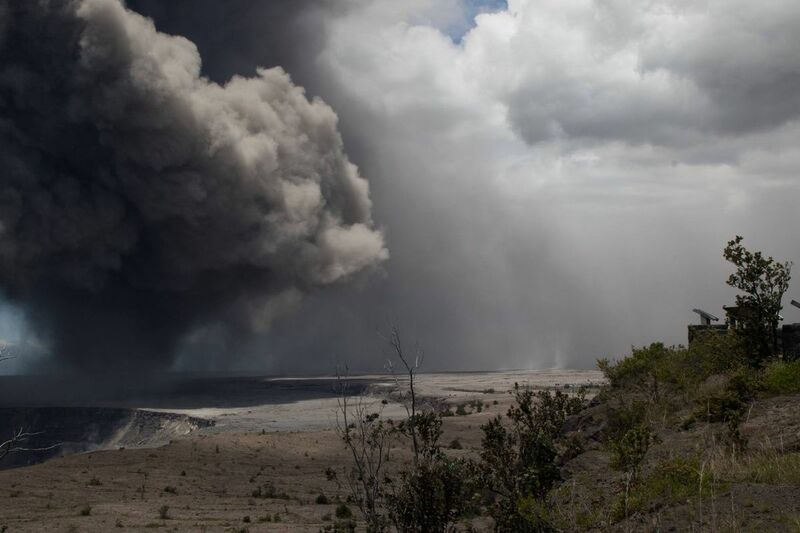 Ash from the Kilauea plume falling onto the Ka`u desert on May 15, 2018. Volcanic eruptions that produce massive clouds of ash are more common in Alaska, where Wallace works, than in Hawaii. In Hawaii, Wallace says, the magma is so close to the volcano itself that it doesn’t build up as much pressure by the time it comes out — producing less explosive eruptions. Usually, that means less ash, too, but explosive bursts of ash do happen, when rocks fall into a vent, for example. “The big question is, will it continue?” she says. If the crater calms down, the warning could be downgraded to “orange.” That means that an eruption is close or underway, but it isn’t likely to produce much ash. Still, as we saw yesterday, “orange” can quickly turn back to “red.” “This is a new and dynamic situation there,” Wallace says. Instagram just switched things up again … on desktop!